Wow... I've really let this thread kinda go to seed a bit. Anyway... lots of stuff happened. Work, life, art-drought, but I haven't stopped playing M&M, which is nice. Gotta go back and fix up a whole bunch of busted links... not so much fun. Anyway, pictures. As is the habit in the game I'm playing in, we periodically switch around characters. Every so often, people get sick of playing the same character and want to play something else, or the GM gets brainfried and someone else steps in to GM a 'Meanwhile...' game. Basically, everyone (or at least a bunch of the players) generate new characters and we play a game set in a different part of the same campaign universe. Previously, in the thread, I've posted characters from 'Meanwhile... In Outer Space', and 'Meanwhile... In Asia'. Next up, new fill-in GM Shaun took over from our regular GM, Tony, to give us 'Meanwhile... In Europe'. For this game, we played superagents of UNISON, gathered from different countries in Europe to battle an evil despot and his Neo-Nazi hordes. 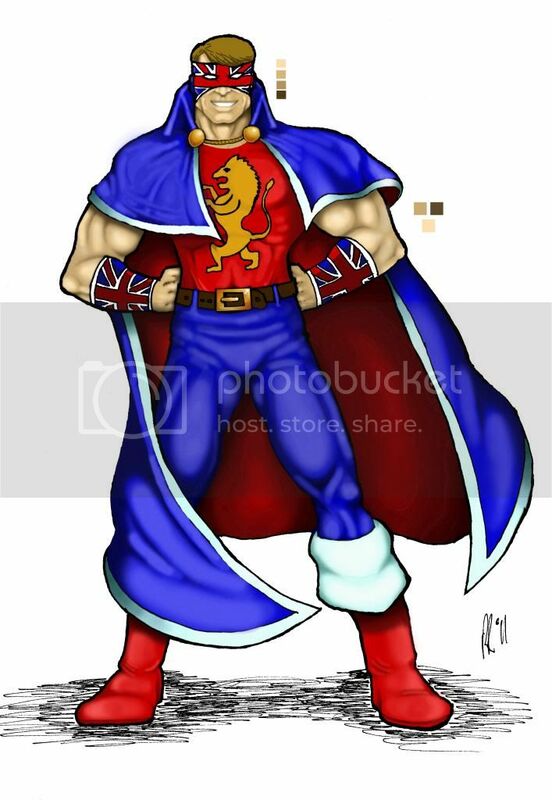 For my character, I dusted off an old character from my high school days then-called 'Lord Britain' (Big Brian Braddock fan, me). However, that was clunky then and even clunkier now, so I amscrayed with a name from the board's own Libra and switched him to 'LORD LIONHEART'. 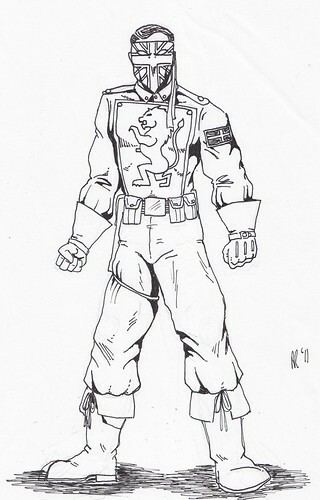 Essentially, he's a riff on Captain Marvel, my favourite superhero ever (with a nod to Marvelman / Miracleman and Captain Britain) with the idea being that in he was a Golden Age hero who forgot his superpowers in the late 50's, only to regain them now, so his alter ego is an eighty or ninety-something man (based loosely on Sir Ian McKellan). One of his colleagues, hailing from the Greek Islands, was a character I wish I'd created. The Demi-God Grandson of Poseidon and fighting Sailor, CAPTAIN TRITON. I'm a big fan of the whole rough-and-tumble, two-fisted dockside brawler and bold adventurer plying his ways on the high seas, and this character was just awesome. That he also had a secret magic sea cave full of ancient treasure and fought sea-monsters was the icing on the cake. Plus, he was just fun as hell to draw. Very nice design. Fantastic work with your airbrush/airbrush tool. Like me, you could use a little work in smoothing out your lines with your inking, but on the whole it's a fantastic piece of work. One of the things I can't help doing is coming up with convoluted backstories and supporting casts/rogues' galleries for my characters, and Lionheart was no different. Here's his Lordship's arch-enemy, his caddish Uncle, who, by use of dark sorcery, transforms himself into the nefarious BARON BLACKHEART! I designed the Baron to be a good 'evil twin' to LL. He's stronger and more powerful (because the baddie should always be tougher than the goodie) but lacks LL's ability to fly, relying on massive jumps. He's based visually on a cross between an evil Circus Strongman crossed with arch-cad and bounder, the sublime Terry Thomas. cobalt-blue wrote: Very nice design. Fantastic work with your airbrush/airbrush tool. Like me, you could use a little work in smoothing out your lines with your inking, but on the whole it's a fantastic piece of work. Yeah, I tend to be a little overenthusiastic rather than disciplined, and I REALLY have to get around to working out how layering works someday. But thanks very much, I'm glad you like it. 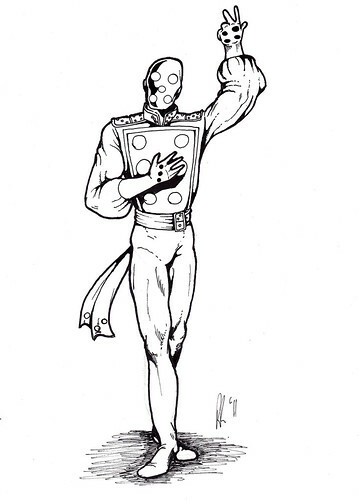 And of course, rounding out LL's rogue's gallery (at least the ones I've drawn), are the arch-criminal responsible for him losing his memory back in 1959, and that same diabolical fiend's brutish henchman. 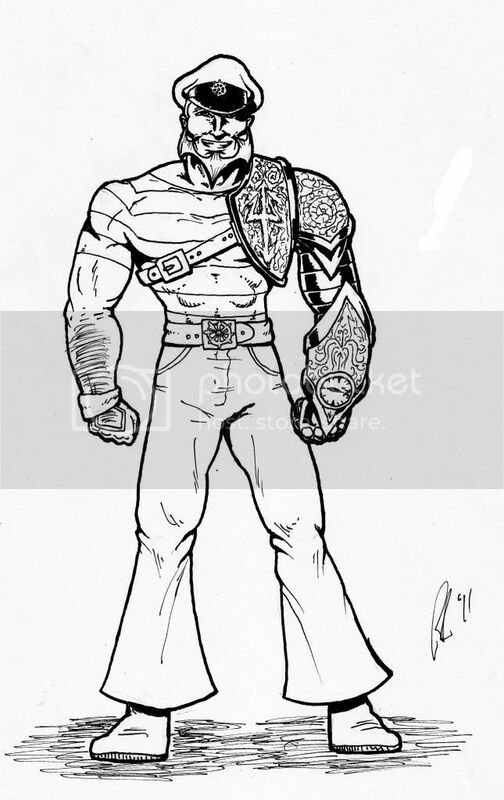 Basically, 40's and 50's LL was designed as a lighthearted British kids' comic hero, so his enemies would be the sort of 'baddies' kids of that time and place would be able to relate to. The evil older relative is a shoe-in, but here are two terrors of the 50's British youngster. The Diabolical HEADMASTER OF CRIME! 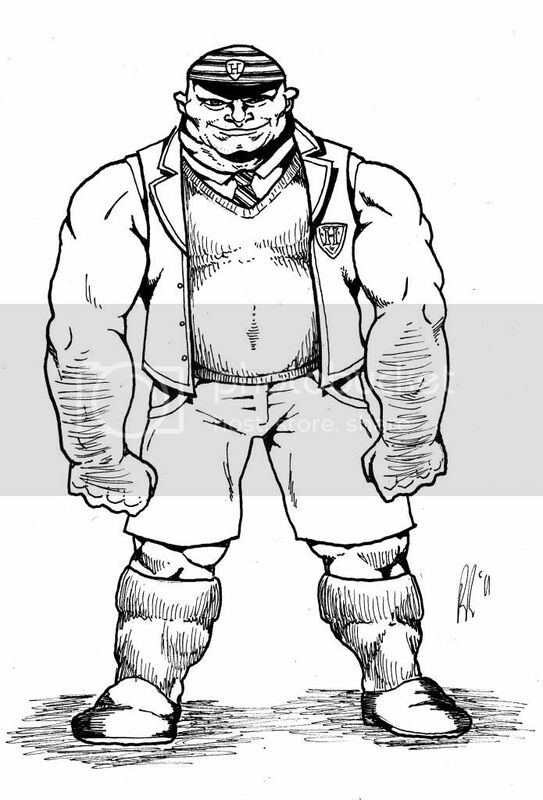 and his thuggish henchman, the BIG BULLY! One of the other PCs for the game was a player who has a hell of a hard time coming up with names. 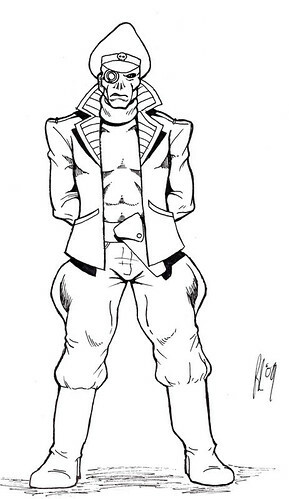 He decided he wanted to play a German character who wore a battlesuit based on reverse-engineered alien technology. Struck for ideas and in desperation, he suggested THE GERMAN as a name. I immediately burst out laughing, which he thought was me thinking the idea was bad, but I immediately thought of the conversation. "So, what's your superhero name." "That's a bit of a weird name." "It's entirely accurate and adequate to my purposes." So here he is, folks... THE GERMAN. Very happy with this design. 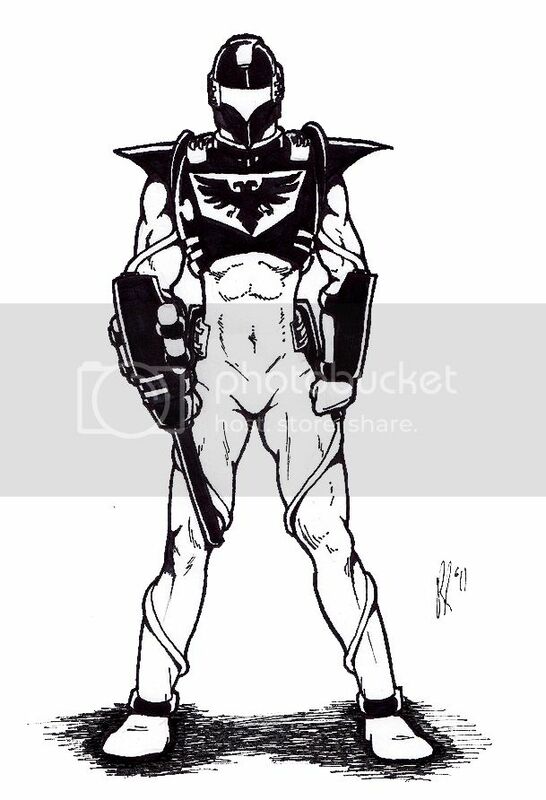 I was initially given... 'He wears a skintight black bodysuit with a weird alien weapon thing on one arm and his helmet has a visor and some communications gear on it. I added the chest insignia to break up the black. Just popped in to say "Excellent Artwork old chap!" Wow... I've really let this thread kinda go to seed a bit. Anyway... lots of stuff happened. Work, life, art-drought, but I haven't stopped playing M&M, which is nice. Gotta go back and fix up a whole bunch of busted links... not so much fun. Don't worry too much Pol Rua, all we creative types hit dry spells now and again - I've felt unable to post anything for months at a time, so I understand what you speak of - so there's no shame in laying low for a while to recover your creative energies. 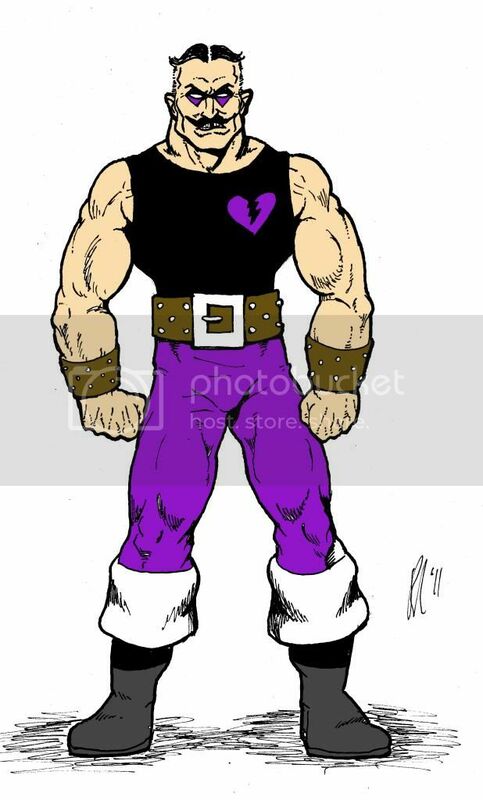 By the way, I love the British characters you've posted on this page and in the spirit of borrowing shamelessly from other creators when they've hit on a good idea, I would like to request the privilege of borrowing Baron Blackheart, The Horrid Headmaster-mind and the Big Bully for the lion-man version of Lord Lionheart, should I ever draw The Union of Justice out of honourable retirement at the back of my mind once more. Oh and for the record, Lord Lionheart must be attributed to Kid Karnivore, who came up with The Union of Justice and did all the typing (I just edited the articles a little). Also, if it was inspiration you ran dry on when you hit that artistic drought, feel free to come up to the 'Settings' forum and borrow it if you ever feel the need - I've always wanted to see more collaborations between patrons of the 'Settings' threads and the 'Drawing Board' but have never quite been able to come up with a way of bringing that about. Please feel free to use any of these guys. As for the settings board, I kind of find it a little intimidating, as I prefer it when I'm not just slogging through pages of text. I shall set me brane to it and see what percolates. Agree with you 100% there. I'll take a look over my stuff and try and figure how I could possibly structure it. But yeah, the big blocks of text with no illustrations is a big factor in the whole intimidation dealie. I understand, but feel moved to defend myself and my fellow worldbuilders (word-based) by saying that while we DO possess creative talents, we are somewhat lacking in art skills, otherwise we'd be posting on THIS forum. Okay, just looking over my stuff, there is SO much art that I haven't posted here. Anyway... where were we... oh yes, Europe. 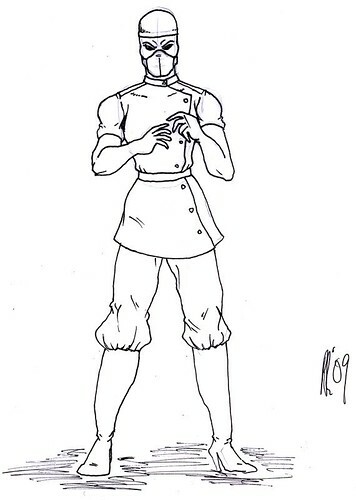 The character I was playing wasn't the first Lord Lionheart, he was a legacy and former sidekick to the previous LL (who wasn't the first either) who was a kind of costumed British spy/commando during WWI. 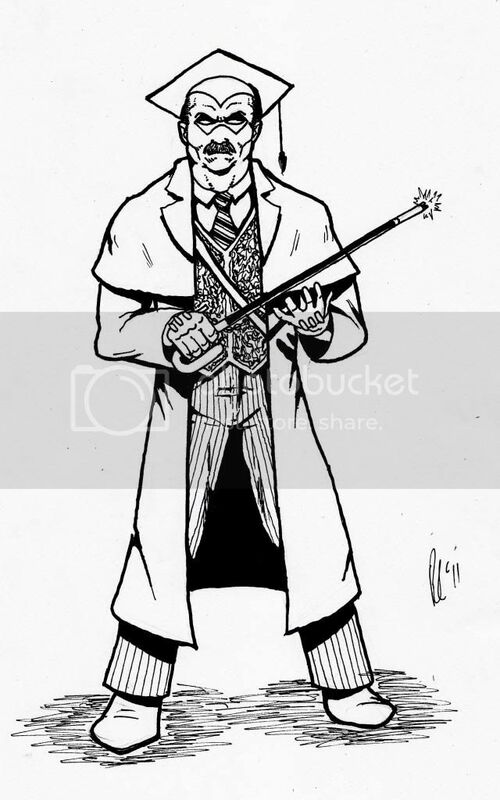 One of the modern British villains I created for the series (though this is the third incarnation, with the first starting out in the mid-late 60's), the nefarious Doctor Domino! Two more excellent illustrations Pol Rua! A throwaway line about 'sharks with frickin' lasers on their heads' led me to this next character. 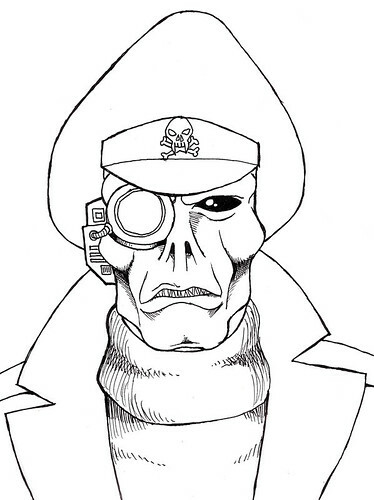 Cap'n Shark, based loosely on the character of the same name who appeared in Hero Games' 'Kingdom of Champions' supplement by Phil Masters was a Silver Age supervillain... a high-tech pirate who plundered ocean liners and cargo ships with his fiendish submarine fleet. He was frequently opposed by OCEAN, a high tech aquatic version of AEGIS, and its agent Peter Pisces, Captain of The Seaspray (My pastiche of Gerry Anderson's 'Stingray'), as well as Silver Age aquatic British superhero, The Porpoise. In the modern age, he received a new lease on life when an obsessed geneticist, using a variation of the formula used to create Megalodon (Freedom City Sourcebook), rejuvenated him as the all-new CAP'N SHARK! He leads a virtual armada of high-tech pirates from his hidden base, with his flagship 'The Leviathan', with his two lieutenants, the cyberneticist, Hammerhead and the geneticist who rejuvenated him, the creepy and terrifying GREY NURSE.